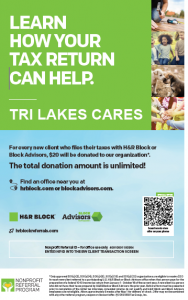 Tri-Lakes Cares is a community based, volunteer supported resource center whose purpose is to improve people’s lives through emergency, self-sufficiency and relief programs. Since 1984 we have been meeting our clients’ most basic needs while helping them move towards self-sufficiency. As the only food pantry and human services organization located in and serving the Tri-Lakes region of northern El Paso County, we are a critical resource for those in need. TLC clients describe their experience at TLC, where they are accepted and respected.